Pickling my way to savored memories. When I was a kid growing up in my parents’ San Francisco home, there were two refrigerators — the main one in the kitchen, and an auxiliary one downstairs in the garage. It was the latter one that was filled with extra provisions — tubs of tofu, cartons of orange juice, and big glass jars of pickles. She would save big glass jars and reuse them, packing them with cauliflower florets, slices of carrots, and stems of mustard greens. She’d pour in hot white vinegar diluted with a little water and mixed with a few mustard seeds, bay leaves and peppercorns, before capping the jars, and storing them in that refrigerator. As the days and weeks went on, we’d enjoy the pickles of her labor. Their snap and tang would jazz up simple green salads or sandwiches. But often, I’d just fish out a few pieces to eat solo for an entirely satisfying snack. So when Jarden Home Brands, maker of the Ball brand of home-canning products, sent me its “The All New Ball Book of Canning and Preserving” (Oxmoor House), I leafed through the more than 350 recipes, and came to a halt at one in particular. 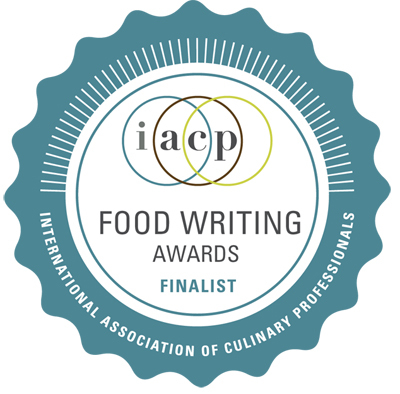 It was for “Refrigerator Pickles in 4 Easy Steps.” Longtime readers of my blog know that for the longest time, I was a can-o-phobe — too afraid to can anything, believing I was surely going to kill someone in the attempt. But last year, with a nudge from Ball, I got over that phobia. I actually made jam. 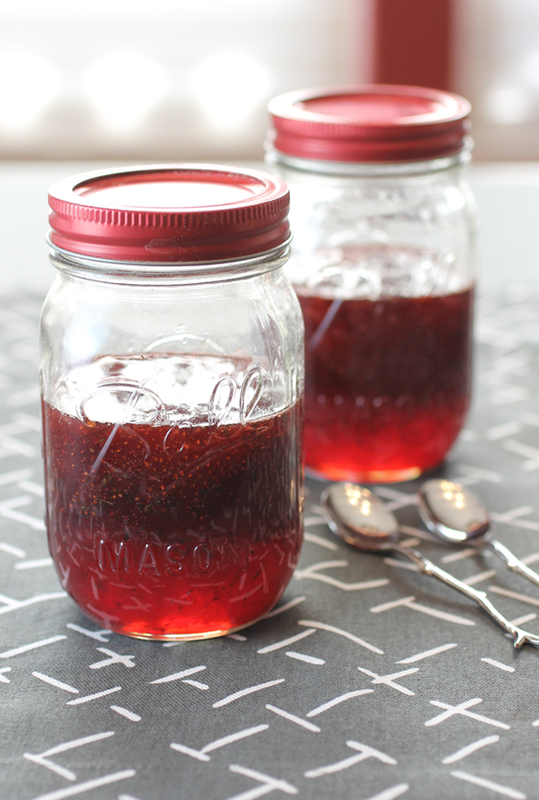 Real strawberry jam that requires water-processing the jars to make them shelf-stable. I not only loved the resulting jam, but can report back that I — and my husband — lived to tell about it all, too. I may have conquered my fear of canning, but this super easy pickle recipe, which doesn’t require water-processing the jars, spoke to me like no other for obvious reasons. It sounded delicious, and it so reminded me of the treasured stash my mother used to keep in the refrigerator. This recipe couldn’t be simpler. I actually doubled it to make four pint jars. 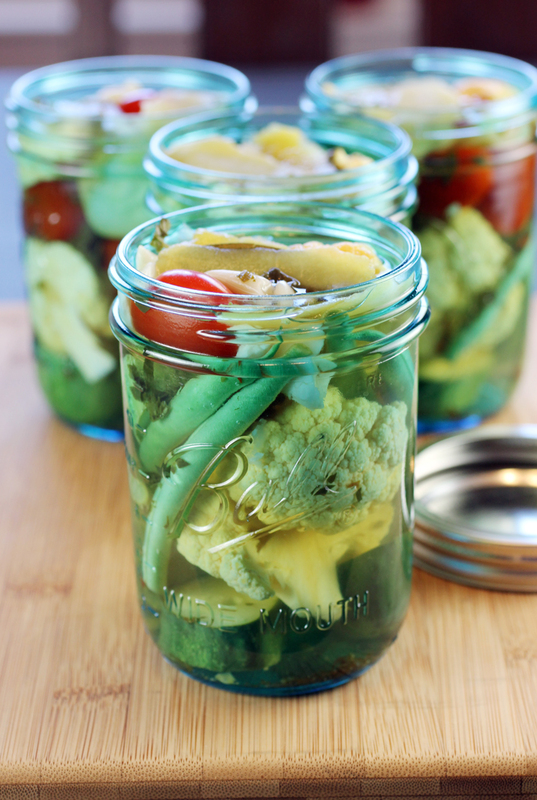 Just sterilize your jars, then fill them tightly with an assortment of veggies. I used orange cauliflower, grape tomatoes, green beans and Kirby cucumber slices. Heat up the vinegar (I used a combination of Champagne and Sauvignon Blanc vinegars), and add sugar, water, citrus zest (I used lemon), crushed red pepper, oregano, garlic cloves and bay leaves. The recipe does call for Ball Salt for Pickling & Preserving, but I just used kosher salt. Once the jars are filled and capped, place them in the refrigerator. The recipe says to wait a month before eating for the best flavor. But naturally, I couldn’t wait. After two days, I unscrewed the lid of one jar, and poked a fork in to pry out a slice of cucumber and a cauliflower floret. Just like old times. They were plenty sassy tasting already. And with that, I was a kid all over again, digging into my Mom’s pickle stash. 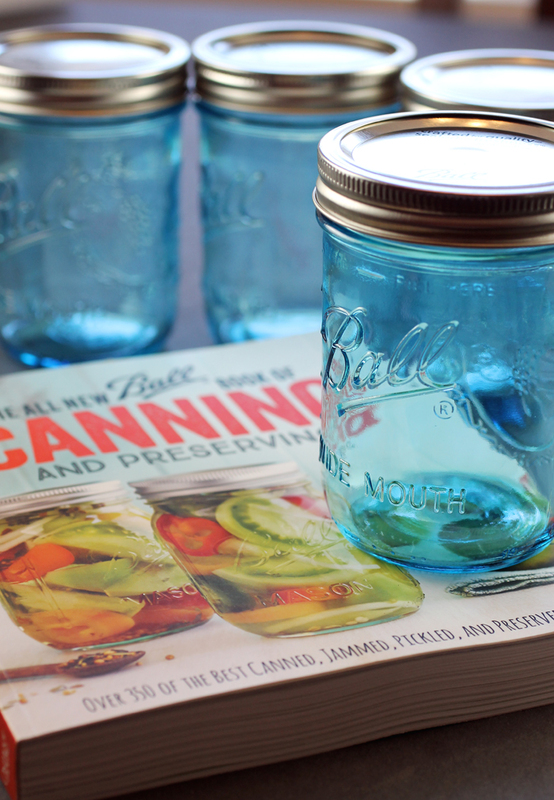 CONTEST: One lucky Food Gal reader will win a copy of “The All New Ball Book of Canning and Preserving” (valued at $22.95), plus four wide-mouth pint jars in the just-released pretty blue color (valued at $8.99), and a $5 coupon to use in the FreshPreservingStore. Part of what you can win. Entries, open to those in the continental United States, will be accepted through midnight PST July 23. Winner will be announced July 25. You’ve read my favorite pickle memory. Now, tell me your favorite remembrance involving pickles or preserves. Best answer wins. 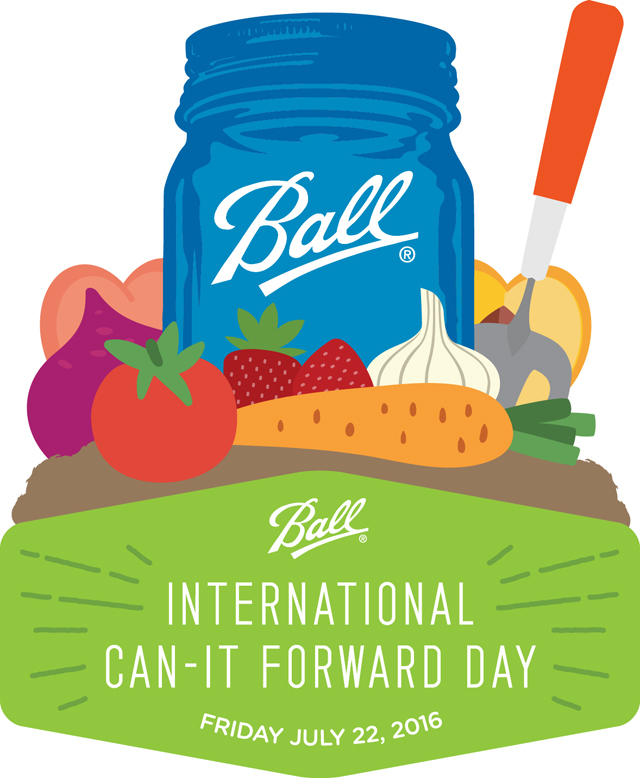 Don’t forget that July 22 is Can-It-Forward Day, in which Ball ambassadors will be demonstrating canning recipes on Facebook live, 7 a.m. to 1:30 p.m. PST. For every engagement received on the videos, whether it be a comment or a “like” or “share,” Ball brand will donate $1 to a local charity. Ball experts also will answer questions via Twitter with the hashtag #canitforward from 7 a.m. to 2 p.m. PST. Ball also will launch a digital pledge page, where you can pledge to can-it-forward, too. Wash and trim the vegetables. Leave them whole or cut into slices or quarters, as appropriate. Add brine ingredients to a small stainless steel or enamel saucepan, and bring to a boil. Reduce heat, and simmer 3 minutes, stirring to dissolve sugar and salt. Note: These pickles are plenty tart. If you like them a little less sour, try decreasing the vinegar amount by 1/4 to 1/3 cup and upping the water by an equivalent amount. from the age of 7 to 14 I would spend my summers at my great grandmas house. She was the best cook. 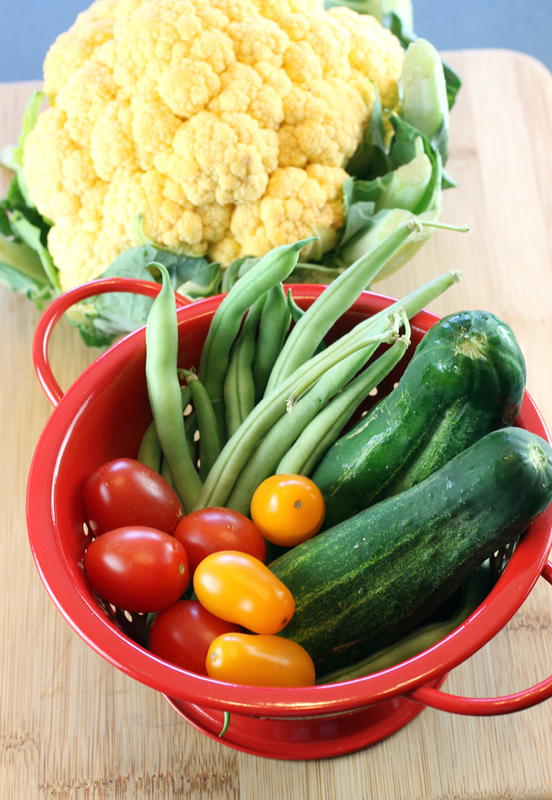 She Made everything from scratch and grew her own veggies. Every summer I looked forward to caning with her. We would plant tomatos for her famous take all day tomato sauce, Cucumbers for her sweet and spicy pickles. 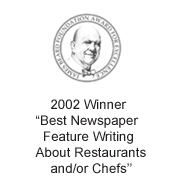 My best memories was of course eating what we made. It may sound weird but my gram always had sweet pickles with her eggs in the morning. It was a summer taste that I will never forget. Now to this day if I’m missing her I always eat sweet pickles and eggs. It brings me back to those wonderful days. You should try it sometime. My grandma taught me in all things canning. We started simple with jam & applesauce. 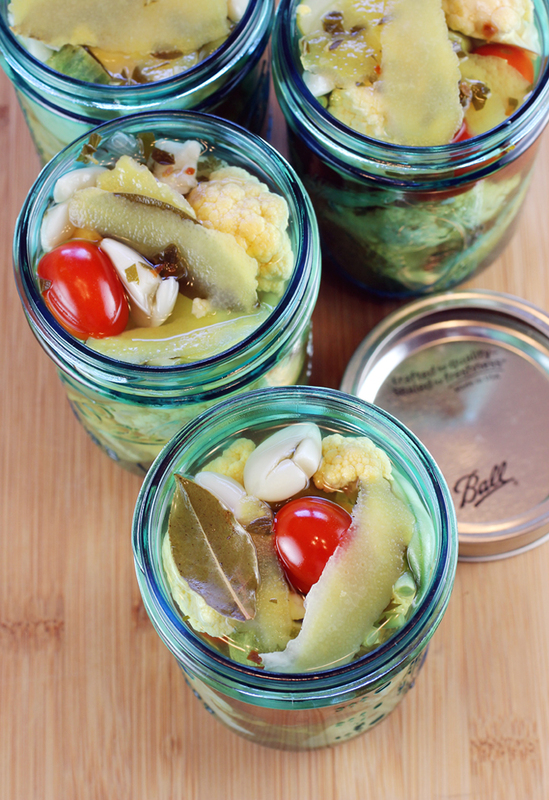 One summer we decided to take a pickling adventure. Anything that seemed like it could get pickled got pickled. Seriously. Anything. My grandpa was so daring and patient, trying all of our ‘creations’. After that summer, we stuck to our favorites. Beets, pickles, asparagus. But I’ll never forget the time spent with her. We had the best times and she passed along a valuable skill to me. Now, every summer I pickle one jar of something out of the ordinary to keep that memory alive. I grew up on homemade pickles and now the next generation is too. Every summer my grandma cans countless cucumber and okra pickles. As babies, pickles are one of the first foods the kids get to “eat,” i.e. disintegrate by sucking on. I was always amazed by the odd looks I get for, one, bringing okra pickles to church events and, two, for my one year old eating about five in one sitting at said events. I came to understand the odd looks a little after the first time I saw pickled okra in the store and the price! I just thought of pickled okra as a standard way to use up too many okra not a item with a gourmet price tag. In my 20’s and enjoying the single life, I would often fly down to LA to visit friends. That always included a day at the beach – warm and wonderful compared to NorCal waters. We would stop at a deli on our way, pick up supplies, lunch, beverages, ice, and for me a huge dill pickle. They always laughed at me, but it was so refreshing … soaking in the hot California sun, I would reach into the cooler, pull out the container and nibble at the kosher pickle, savoring each crunchy, sassy, cooling bite. I always remember those fun days in the sun whenever I have a kosher dill, but have never been able to replicate the flavors and crunch. I would love to learn how to make my own and be able to recreate my memories just like you have! My husband tried to can mustard seed pickles like the French pickles, but they turned out tasting like dill. He hates the taste of dill. When I was young my grandma would pickle everything! I can still remember going down to the basement and seeing rows and rows of jars on the shelves. The first time my kid tried a pickle, he made the funniest face but then kept taking more bites. My grandfather used to make his own pickles and grew all the ingredients (well most). He grew pickles, the spices and such in the huge garden in the back yard. I remember helping him harvest the cucumbers and later eating the pickles. The jars would sit on the side counter of the kitchen while they cooled after the canning. I recall helping home check the seals. I wish I had his recipe but it was all in his head and he never wrote it down. When I was little my mom canned pickles every Summer. There was nothing better to crack open in the middle of Winter…..it reminded me of Summer. In West Texas in the 1950s I recall that my grandmother was fond of Watermelon Rind Pickles. It seems that not just any watermelon would do. The rind had to be firm and deep. You peeled your pieces with a carrot scraper and cut leaving a blush of pink on the inside edge. If she and her cook found a watermelon in the garden that they thought was right for pickling they would start cutting it up and piling the juice red insides in a huge bowl. 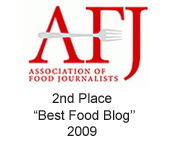 I can remember gorging on the watermelon while they worked. There was ginger involved too, but I don’t remember how. I always loved my great grandma’s pickled string beans, but my favorite memory is fighting with my sister over the pickled garlic in the bottom of the jar. She would add extra after she found out we loved it so much. I do the canning now and use her recipes, it’s never quite the same as when she made them though. Every summer in the 70’s/80’s we would leave our little city in upstate NY and drive to the local U-Pick farms to gather ingredients. On the ride home in the Griswald-esque station wagon we would collectively decide what what canning recipes we wanted to make. 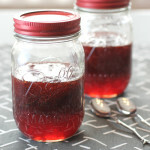 My favorite was always jam/jelly even though I remember many times being told NOT to get too close to the canning wax so that I didn’t get hurt. Canning has come a little ways since those days but I would forgo any of the modern conveniences to go back to those simpler times.